Go back to basics with this crowd-pleasing number. 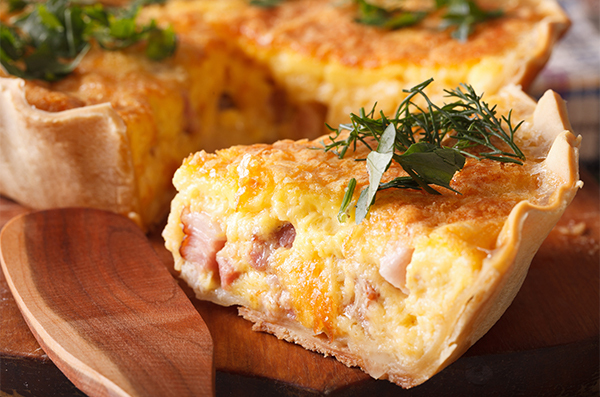 Quiche Lorraine is one of the classics of French cooking, much loved for its hearty combination of eggs, bacon, cheese and pastry. The finished product looks impressive but it’s actually very quick and easy to make, using ready-rolled short crust and a combi microwave to cut down on prep and cooking time. Grease and line a 23 cm pie plate with short crust pastry sheets. Place plate on metal tray in lower shelf position and cook for 15 to 17 minutes at 180 °C. Allow to cool slightly. Place bacon between two sheets of paper towel on a dinner plate. Cook bacon on 1000 W for 2 minutes to 2½ minutes. Sprinkle bacon and cheese into cooked pie shell. Beat eggs, cream, milk and nutmeg and pour over bacon and cheese. Place on metal tray in lower shelf position and bake at 180 °C for 22 minutes or until set. Serve (warm or cold) garnished with a sprig of fresh herbs. Made using the Panasonic NN-CS894S steam combi microwave.